So I decided it was time to upgrade my PS Vita's Memory Card from 4GB to 16GB. I originally bought the 4GB Memory Card as just a placeholder to let my PS Vita play games and save game data to the Memory Card. After a while though, it became apparent that I would need a bigger Memory Card in order to save downloaded PS Vita games to my device. A single game averages between 1GB to 3.5GB each so a 16GB Memory Card will fit about 4 - 8 games. So I went to my nearest game shop in search of a 16GB Memory Card. I was pleasantly surprised to find out that the game shop had run out of 16GB Memory Cards and the only one left was a Mega Pack. What was this Mega Pack? 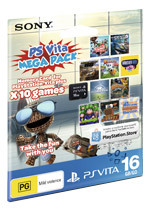 Well, the PS Vita Mega Pack 16GB is pretty much a games + memory bundle in which you pay a little extra for the Memory Card, but you are given a code to redeem 10 free games from the PlayStation Network Store. The only games I find worth downloading are Little Big Planet PS Vita, Wipeout 2048 and MotorStorm RC. Of course, if you are into the classic or obscure games, you may find the rest entertaining enough. What Would X Do For Money?